Office Furniture – What’s Trending Now! There is no doubt that the office furniture and seating marketplace is moving faster now than ever before. To help you to keep up with the latest trends we have listed the key trends that you should be aware of. Technology and business is changing so fast that you may need a design and layout that is flexible and capable of adapting to the changing landscape. Look for the smart solutions that will make your workplace hum with efficient functionality. Have a look at a bench style format, as it offers maximum versatility. You need to look at furniture that is future-proofed, in that it can adapt to changing requirements. Great examples of smart office furniture that facilitates high performance are modular workbenches, desk pods, meet point tables, modular soft seating, breakout furniture and acoustic elements. Workspaces that integrate with technology will become the norm. Office furniture will facilitate the wireless charging of devices, have built-in power adaptors and multimedia capabilities. Monitors will no longer be static, the sharing of on-screen information will be facilitated by gas strut assisted risers. Moving and showing information will be a fingertip control point. 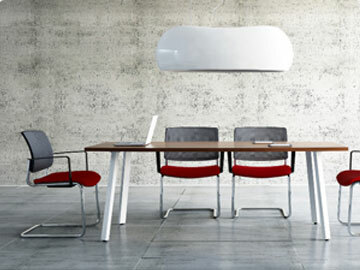 Furniture that delivers the required benefits to employees will become more and more popular. Sit/Stand desks is now receiving a lot of interest and more and more employers are adopting practices that contribute to wellbeing at work. Another area being looked at are feature rich posture seating, it costs more but what price would you put on more efficiency, comfort and actual positive effects on your health. Businesses will more and more view an investment in comfort as one of their more important decisions in the work environment. I predict that that introducing a natural ambiance in the work environment with the introduction of planters, living walls and desk plants will all be big in 2018. Colours help to convey moods that in turn can influence productivity within the office. Soothing and cool blue is predicted to be big in 2018, bringing a calming ambience to the office atmosphere. We all now bring very valuable items to work, such as smartphones, laptops, tablets and electronic car keys and we need a personal space to keep them safe and secure. Lockable desk pedestals will be the perfect solution. The requirement by individuals, micro-businesses and start-ups for co-working facilities means that these spaces will become more common and will need kitting out in a manner that allows for cross-field interaction and discussions. Up until now the provision of areas where employees can put their feet up and relax has been in the main the preserve of large IT companies to help support a more enjoyable work experience. Technology will help drive the growth in these social, collaborative and breakout areas. Coffee machines are increasingly becoming a feature in these areas. Companies will more and more realise the importance of looking after staff and providing a fun and exciting work environment.